RESTORING QUALITY PRODUCTS TO THE NEW GENERATION OF AFTERMARKET PERFORMANCE PARTS. The reason we offer this kit is to provide buyers with an aftermarket expirience but also obtaining an OE pedal like feel. This kit you are purchasing includes a Original Honda Pressure Plate, Top1 Racing Disc, & Bearing kit. &###xA0;Our 6-Button sprung racing DISC provides a lighter & quicker shifting for all stock-high power car applications. In this specific kit, its ideal for stock motors. &###xA0;We use components that are manufactured in the USA to ensure reliability & outstanding performance. Unlike the competition, we do not import any parts from overseas. &###xA0;All our products are built by certified engineers with over 25 years of expertise. &###xA0;sprung retainer assembly boasts six hardened steel springs & six severe duty retainer rivets, ensuring power & reliability. The sprung design reduces driveline shock & spline wear due to torsional dampeners. It has a quiet operation by reducing torsional vibrations. &###xA0; Our wrap-around spring windows provide support & reduce stress concentrations, which are frequent causes of failure. &###xA0;This disc gives you the best race feel engagement & an extended life with the premium ceramic material we use from MIBA. This will allow much more aggressive driving & gear changes. 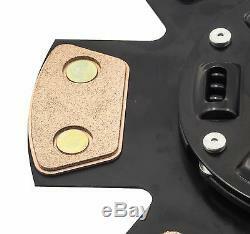 You will have clutch chatter on ALL puck style clutches, do not panic. Difference between the stage 2 & 3 disc is the formula. Stage 3 disc is more aggressive. Super low wear diaphram spring. Specially high frequency induction heat treatment. Kit Includes The Following:&##xA0. Original Honda(OEM)&###xA0;Pressure Plate&##xA0. Top1 6 Puck Racing Disc (220mm, 24&###xA0;Spline). Bearing Kit (Release Bearing, Alignment Tool, Pilot Bearing). ALL HYDRO B SERIES SWAPS. The Top1&###xA0;Chromoly Flywheel is designed by CAD enginneers & CNC machined for accuracy. All of our flywheels are balanced to each spec. 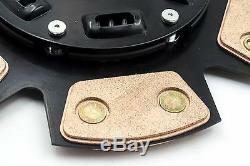 Incorporates our special design which enhances the airflow for improved clutch cooling. &###xA0;Top1 Flywheels provide significantly improved engine response, acceleration & a higher degree of safety than the heavy stock flywheel. Many competitor flywheels are too light, fragile & expensive. Our flywheels are recommended for daily driving, track, & road race use. Top1&###xA0;flywheels provide maximum gear life which means gears will not wear out or fall off. Chromoly forgings are three times more rigid than aluminum. It has the lightest & lowest inertia. &###xA0;PRC&###xA0;offers exactly what performance enthusiasts desire. 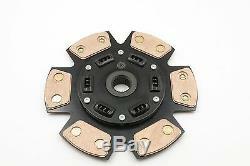 &###xA0;Compatible with all Clutch kits including: exedy, action clutch, act, fidanza, clutchmasters, oem, & no brand. Gear rattle/noise is normal when using a lightened flywheel. High-grade 4140 Forged Chromoly Steel. Exceeds SFI 1.1 Specification. Ring Gear is Milled onto the Flywheel to Prevent it from Separating. 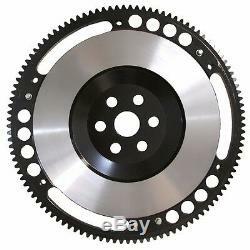 Fits OEM Clutch & Many Other Brand Clutch Kits. 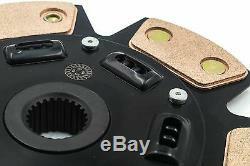 Part numbers are stamped or etched&###xA0;on the pressure plate. Our policy lasts 30 days. O be eligible for a return within the 30 days, your item must be new & unused. It must also be in the original packaging. The product has been used. Any item not in its original condition, is damaged or missing parts for reasons not due to our error. 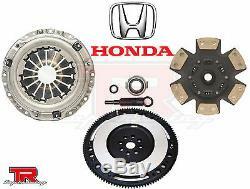 The item "HONDA Cover+Top1 STAGE 2 CLUTCH KIT+CHROMOLY FLYWHEEL 94-01 Acura Integra 1.8L" is in sale since Wednesday, May 16, 2018. This item is in the category "eBay Motors\Parts & Accessories\Car & Truck Parts\Transmission & Drivetrain\Manual Transmissions & Parts\Manual Transmission Parts". The seller is "top1racing" and is located in Montebello, California. This item can be shipped worldwide.